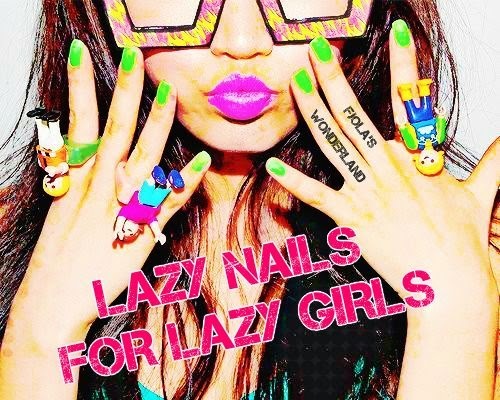 HEY hey Lazy girls ,this is an article all about you (well sometimes and me too:P ).Who said laziness and nail art can't have a perfect match?!!! Ok lets admit it not all of you have much time or the patience to create arty nails.And also don't have the time or the money for a weekly nail salon.So here we have a cheap, easy and timeless tutorial frompopsugargirlsguide channel on how to be in fashion and have arty nails in zero time!!! P.S. TIP OF THE DAY : If you want you manicure last more then put a top coat every 2-3 days on your nails.Also this is a trick to avoid and prevent split ends. In this video you are going to watch step by step how to get polished with nail applique...Anytime .anywhere in zero time !!!! !